Map dependencies. Analyze impact of changes. Blueprints™ is a dependency mapping tool for documenting and understanding interactions among complex IT applications, systems, and networks. 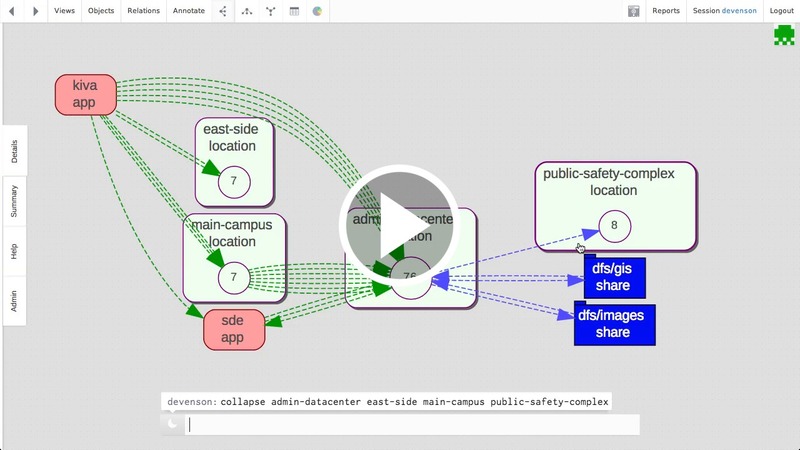 Systems administrators, network administrators, and application analysts use Blueprints™ visualization and dependency mapping capability to make IT changes safely and reduce risk of daily operations. Construct a model of your network, datacenter, software dependencies, business processes, and more. Then put that data to work. Get instant impact analysis, view dependencies, run simulations, generate reports, tables, and charts. Blueprints™ does it all on-the-fly. Blueprints™ enables continuous rendering of tracked resources providing powerful real-time awareness. Users can work individually or join together to share the same perspective, chat, and collaborate in real-time. Blueprints™ is delivered via SaaS or an on-prem virtual appliance. Each comes with full support, backups, training, and free upgrades throughout your subscription.